Sophisticated and stylish vacations by the sea. The Martinhal Sagres Beach Family Resort Hotel occupies a vast 25 hectare property in the Algarve, situated over the Martinhal beach, in Sagres, and surrounded by the Vicentina coast national park. An international team of architects, landscapers and designers managed the creation and construction of this magnificent five star resort, intent on harmonizing it with a landscape of unique character and benefitting from its superb location. To optimize the fusion with its surroundings, the buildings were constructed using local materials and simple, low geometrical forms, and the property's green areas were kept and enhanced. In the interior, free spaces and exclusive pieces created with natural materials, such as cork, cane and stone, receive us in a homely but luxurious environment with a discrete, intimate and artistic sophisticated style. You can stay in the comfortable hotel rooms, with a sublime view of the sea, from broad verandas or private terraces with access to the gardens. As an alternative, you can choose one of the spacious houses that are distributed throughout the safe and tranquil village, offering more privacy and are just a short walk from the beach. This resort has several quality restaurants and bars that will serve you on any occasion, a dynamic kids club that is the ideal support on your family vacation and still the Finisterra SPA, a temple of wellbeing that guarantees you those moments of perfect relaxation during your stay. From Lisbon, take the A2 highway to Algarve and at the end follow the A22 (Via do Infante) in direction of Portimão. From Faro, take the A22 (Via do Infante) and follow in direction of Portimão. Take the second exit of A22 to Lagos and follow the direction of Vila do Bispo. On the second roundabout follow the indications to Sagres. 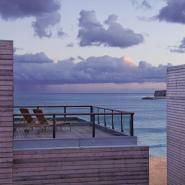 The hotel is situated on the Baía Martinhal on the left side of the N268 road, about 1 km before Sagres.